Phool Mahal is the most ostentatious among all the palaces inside Mehrangarh Fort. It has a ceiling made of gold filigree work. The furnishings are equally opulent. Maharaja Abhaya Singh who ruled from 1724 to 1749 brought the gold from Ahmedabad in Gujarat as spoils of the war after his famous victory over the rebellious Mughal governor, Sarbuland Khan. 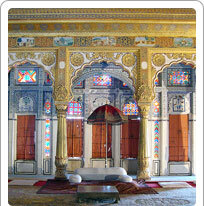 The Phool Mahal also has several royal portraits, beautiful paintings adding to the ambience and Raag Mala.